A studio monitor is no ordinary loudspeaker. Unlike a conventional speaker, a true monitor must be unerringly accurate, with a flat frequency response and vanishingly low distortion. It has to tell you, the music producer —dependably and unquestionably— exactly what is or is not in your recording. In a studio-grade monitor speaker, there is no place for the usual list of speaker colorations and limitations prevalent in conventional loudspeakers. Response peaks\dips, uneven polar response, high THD, nasal midrange, bloated mid-bass, and crossover-induced phase incoherence do nothing but undermine the confidence demanded for superior mix performance. Introducing M-Audio’s BX8-D3 monitors—the return of a studio icon and the successor to the industry-renowned BX-D2 monitors. 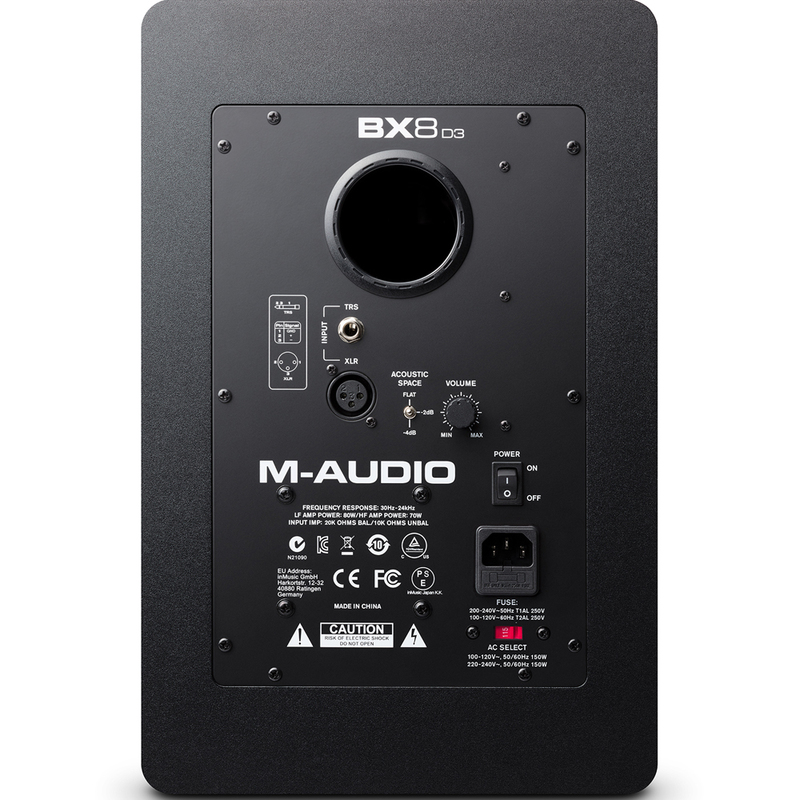 Trusted by recording/mix engineers and composers globally, M-Audio’s BX monitors guarantee absolute surgical precision and repeatable engineering excellence. 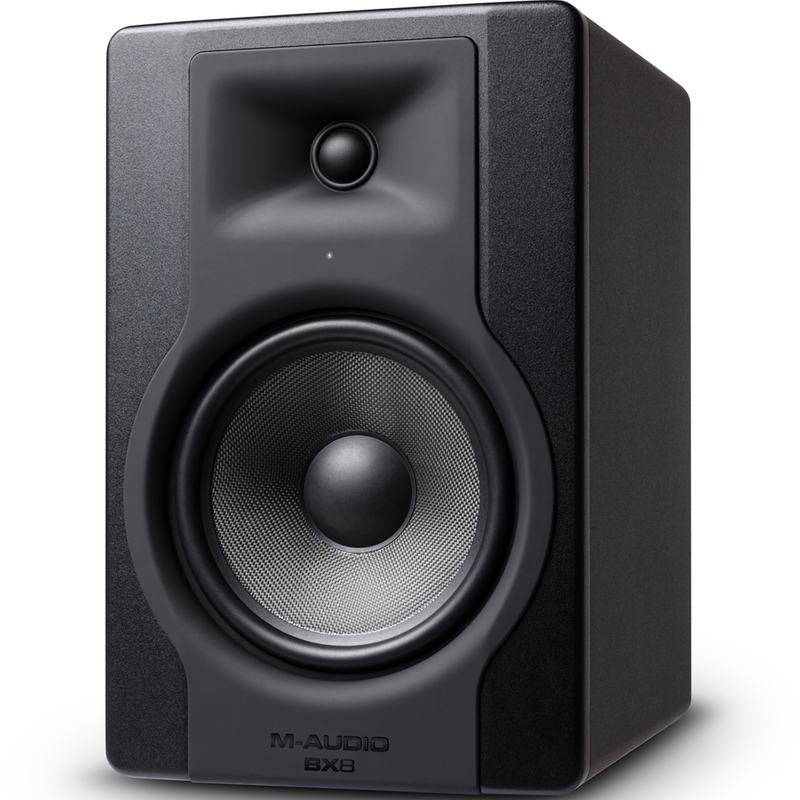 Listen with confidence: with M-Audio’s BX8-D3 studio reference monitors, you’ll hear everything in lifelike detail, so your mixes and recordings will sound their best! A monitor’s drivers are the heart and soul of its performance. Driving the low-end and midrange, BX8-D3’s 8-inch military-grade Kevlar® woofers are rigid and lightweight, delivering outstanding transient response whist negating unwanted “cone breakup.” BX8-D3’s treated silk dome tweeter provides the perfect combination of low mass and the absence of audible resonances that plague conventional tweeters. Together, the BX drivers deliver critical detail, nuance and dynamic accuracy, so your mixes have the veracity and transparency you demand. With M-Audio’s BX8-D3, every detail has been meticulously engineered with one goal in mind - to facilitate the freedom to mix with confidence. BX8-D3 monitors have a rear mounted bass port, meticulously engineered to the exact length and diameter. The result? Deep, defined bass response with maximum bass extension and resolution. When combined with a smoothly-flared port, BX8-D3 monitors markedly reduce the audibly-intrusive air turbulence that results when bass is played back at high sound pressure levels (SPLs). BX8-D3’s tweeter is mounted in a custom waveguide for reliably accurate dispersion that eliminates unwanted high-frequency “scatter,” whilst ensuring a soundstage that remains consistently wide and stable. For seamless setup and easy location of the optimum listening position, the BX8-D3’s front-mounted positioning LED shines brightly when you’re located in the perfect listening spot, for uncompromisingly accurate and reliable critical evaluations. Finally, BX8-D3’s iconic design on the front panel—M-Audio’s famous “keyhole” shape—is more than just an attractive look: This special “fastenerless” design ensures so there are no driver attachment screw heads to interfere with the sound coming from our drivers. At M-Audio, we understand no two listening spaces are the same. Therefore, the BX8-D3 monitors custom tailors your sound to your environment, so you will always experience sonically-true, reassuringly-accurate sound reproduction. Negate problematic bass frequencies and limit the impact of nuisance standing waves thanks to BX8-D3’s special Acoustic Space control for precise adjustment of BX8-D3’s sound output in line with your studio space. Connectivity Covered whatever you needs, the BX8-D3 Studio monitors guarantee to assimilate into your existing setup with ease. Combining conveniently-located, rear-mounted XLR and 1/4-inch balanced inputs, BX8-D3 connects to virtually all studio equipment including mixers, interfaces, DJ gear and more.